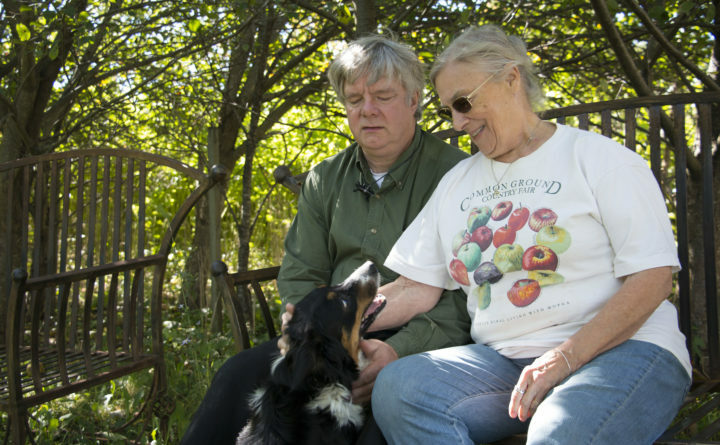 Jim Baranski and his wife, Charlotte Young, sit under apple and cherry trees petting their dog, Sweet Fern, on Oct. 5, at their home, Shalom Orchard in Franklin. Perched on a hill in eastern Maine, Shalom Orchard is a historic farm with a rare offering: organic wines made of apples, pears, blueberries and other locally grown fruits and berries. Once a common beverage throughout New England, non-grape fruit wines are now few and far between — especially of the organic variety. Certified organic in 2005 by the Maine Organic Farmers and Gardeners Association, Shalom Orchard remains the only winery on Maine Organic Farmers and Gardeners’ list of over 530 certified organic producers in Maine. “There are challenges,” said Jim Baranski, who owns and runs Shalom Orchard with his wife, Charlotte Young. Nevertheless, the couple is devoted to growing fruit and creating wine without the use of any chemicals. 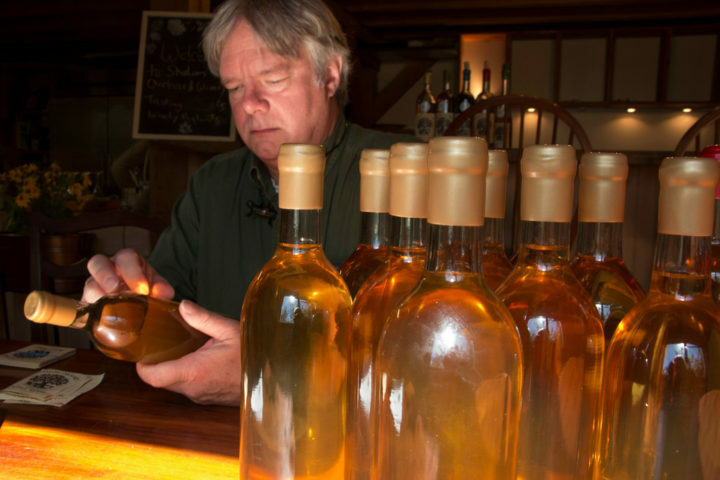 Jim Baranski places labels on newly bottled dry mead on Oct. 5, at Shalom Orchard, an organic farm and winery in Franklin that he owns with his wife, Charlotte Young. 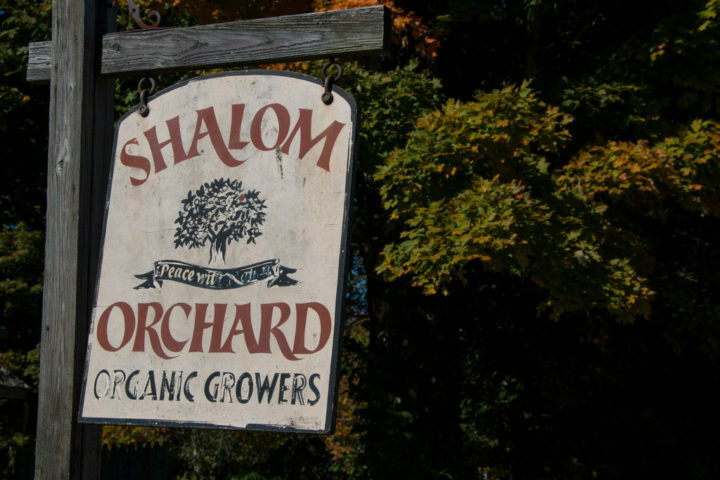 Located in the small town of Franklin, Shalom Orchard was established in 1995, when Baranski and Young moved to Maine from Connecticut, where Young had co-owned a commercial vineyard and winery in the 1980s. Both on their second marriage, the couple were drawn to Maine after a memorable weekend with Baranski’s son on an island off Port Clyde. The farmhouse at Shalom Orchard dates back to about 1840, though the surrounding land had been farmed long before that. In the 1960s, the property was named Shalom Farm by an Episcopal minister, neighbors told Young and Baranski. They decided to rename it Shalom Orchard to reflect the vast apple orchard on the property, which includes more than 1,000 trees that produce about a dozen varieties of apples. Since purchasing the property, Young and Baranski has greatly increased the land’s fruit and berry production. In addition to the apples, they now tend about 8 acres of blueberries, a raspberry patch, a grove of cherry trees and a mass of hardy kiwi plants. They also have several vegetable and herb gardens and greenhouses, a dozen Rambouillet sheep for wool and meat, about 50 laying hens and about 100 chickens for meat. 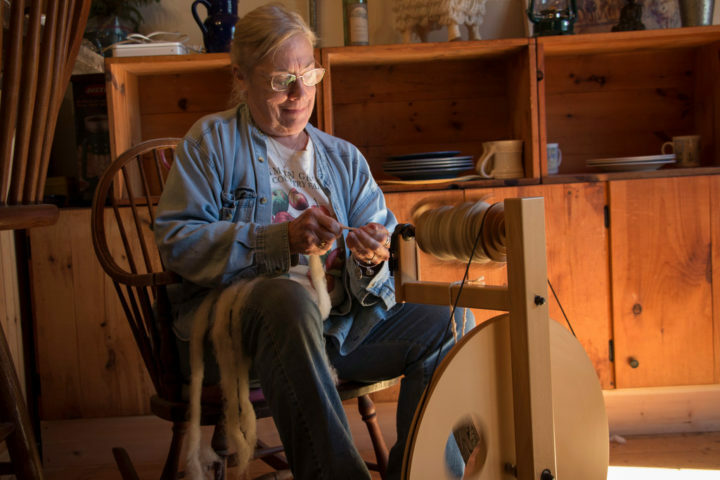 Charlotte Young spins yarn from her sheep's wool on Oct. 5, at Shalom Orchard, an organic farm and winery in Franklin that she owns with her husband Jim Baranski. Early on, they decided their operations would be strictly organic. Young had been active in the 1970s environmental movement to raise public awareness about pollution, and in Maine she recognized an opportunity to live in a more sustainable, eco-friendly manner, she said. Going organic just seemed right. In 2000, beside the old farmhouse, the couple began the construction of a beautiful, energy-efficient winery, complete with a modern basement for fermentation and storage, an industrial kitchen, a wine tasting room with a dining table and bar, and a loft apartment. With the hemlock beams joined together with red oak pegs, there’s not a single nail in the building, Baranski said. A sign marks the driveway of Shalom Orchard, an organic farm and winery in Franklin. They then worked to develop a variety of wines from fruit grown by the orchard and from other local MOFGA organic-certified farms. Nowadays, they specialize in making apple, blueberry and cranberry wines, with smaller productions of raspberry, blackberry, kiwi, maple and wintergreen wines. They also make a dry mead, made with organic honey. What they don’t make is grape wine, which is the most commonly produced type of wine in the world. That’s because they’re more interested in the New England tradition of making wine from other types of fruit, as well as berries and honey. During the winemaking process, yeast is used to break down the sugar to create alcohol. This process is called fermentation. Many of the apples are ripe on Oct. 5, at Shalom Orchard, an organic farm and winery in Franklin. Organic apples usually aren’t as uniform and flawless as apples that are treated with pesticides because they’re more susceptible to insects and diseases, such as apple scab, which creates lesions on the surface of tree leaves and fruit. For this reason, organic apples often don’t make good “table apples.” So from the beginning, Shalom Orchard has been focused on using most of their apples to make cider, wine and applesauce — products where the apple’s visual perfection doesn’t matter. “We’ll get some table apples — sometimes 25 to 30 percent — but that’s not our focus,” Baranski said. Nevertheless, Shalom Orchard gets plenty of pick-your-own customers each year. 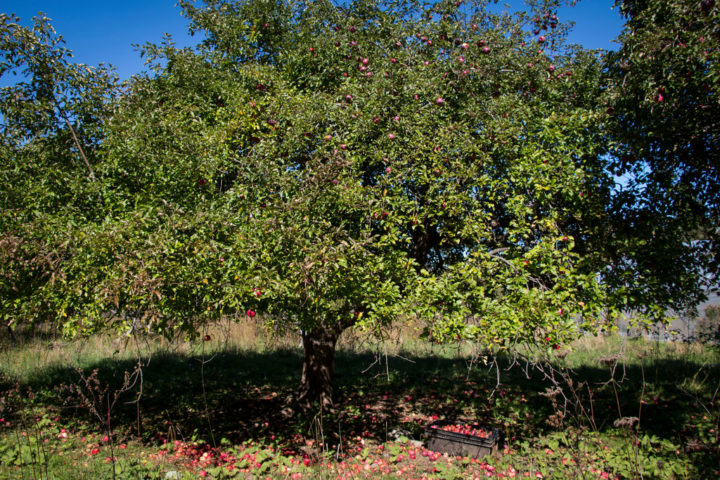 To defend their trees against apple scab, Shalom Orchard sprays them with organic sulfur. And to combat insects, such as plum curculio and apple borers, they spray powdered clay. 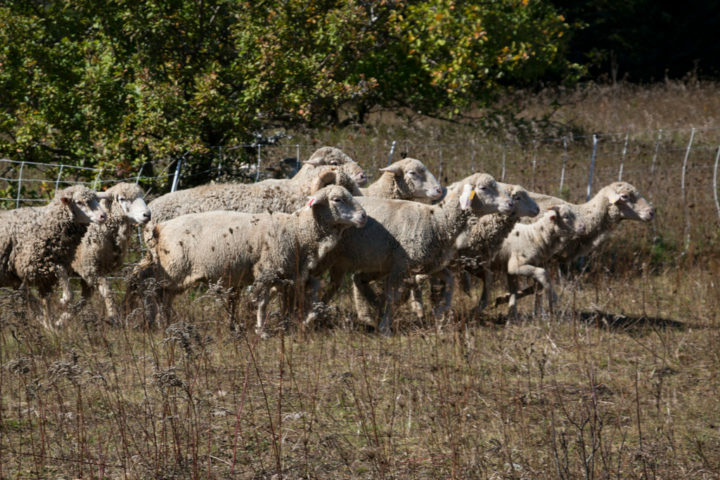 A herd of Rambouillet sheep run across a pasture on Oct. 5, at Shalom Orchard, an organic farm and winery in Franklin. For their wine to be certified organic by MOFGA, the winery needs to meet specific requirements laid out by the U.S. Department of Agriculture. Not only can they not spray their fruit with chemicals, they also can’t use certain chemicals in the winemaking process. For example, in conventional winemaking, chemical compounds called sulfites are used to sterilize fruit, prevent oxidation and keep unwanted bacteria at bay. But in organic winemaking, the use of sulfites is not permitted. Unlike many other non-grape fruit wines — which are sweet, dessert wines — Shalom Orchard’s wines are dry with only a hint of sweetness and are meant to be enjoyed with meals. They’re also complex, because of the variety of fruit Shalom uses and their tendency to mix batches. Their apple wine, for instance, is a blend of 27 varieties of apples. “The more different kinds of apples you have, the more complex your wine or cider is going to be,” Baranski said. 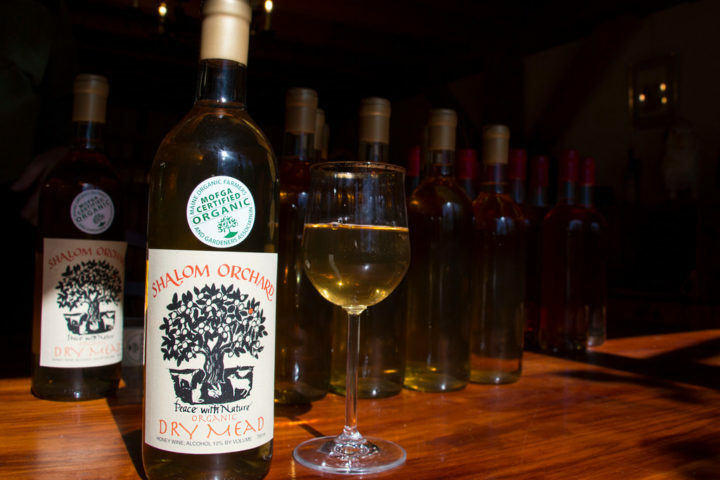 Dry mead is just one of several organic wines made at Shalom Orchard, an organic farm and winery in Franklin. These are the things you learn from years of experimentation. Shalom Orchard wine is now sold at more than 40 retail locations throughout Maine, including Bangor Wine & Cheese, Tiller & Rye in Brewer and Natural Living Center in Bangor. They also sell their wines at several farmers markets, including the Ellsworth Farmers’ Market, Blue Hill Farmers’ Market and Trenton Grange Farmers’ and Artisans’ Market. And their tasting room at the orchard is open most days from 10 a.m. to 5 p.m., though they advise visitors to call ahead just to make sure they’ll be home. Also, coming right up, Shalom Orchard is hosting a cider-making event from 1 to 5 p.m. on Sunday, Oct. 21, with food, live music and wine tasting. They’re located at 158 Eastbrook Road in Franklin.